Dhaka, 6 October, Abnews: Bangladesh Test and T20I skipper Shakib Al Hasan’s injured left hand little finger will never be fit. Doctors will only try to make it better to play cricket, said Shakib before departing for Australia Friday night to consult with doctor Greg Hoy in Melbourne. “This finger will never fully recover as it’s a soft bone so there is no chance to recover fully. Doctors will try to bring my hand to a condition so that I am able to hold the bat and continue playing cricket,” Shakib told the reporters yesterday. “Until the infection comes down to zero no doctor will be able to do a surgery on my finger. If they try to do the surgery then the infection will go to the bone and the entire hand will be in danger. So at the moment the main thing is to decrease the infection,” he added. 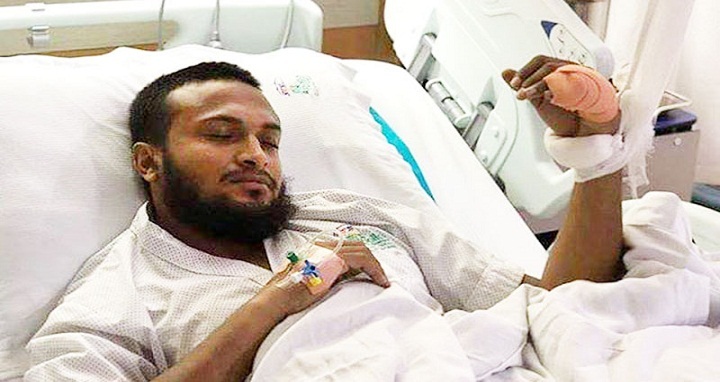 Shakib injured his finger in the final of the tri-nation series in January this year when he dived to stop a single and dislocated his left hand’s little finger upon impact with the ground.